This Saturday’s training session at Bondi was a particularly special one for me. My little Sister Pia has featured on here a couple of times with the odd cameo. But did you know I have another sister? You wouldn’t have seen her on here before because she lives all the way over the other side of the country. On a farm. Inland from the ocean. And she has never been ocean swimming. Well this weekend the little one had her engagement party and the bigger one came over…and I somehow convinced them BOTH to come along for a swim!!!! I love those girls! I love that they came along and gave it a go because I asked them to. I love that they loved it, and I loved spending that extra time with them! It was a fantastic day. The water is still warm, we had a great crew of people (who didn’t even get too overwhelmed by the family reunion contingent), and the conditions were great. Mel was initially apprehensive…swimming on the West coast is a little more hazardous as there are more sharks…but the most dangerous thing on the beach was the risk of getting too carried away! Then to top off a magical swim, there was body surfing! Right off the shallow bank and straight onto the waves…brilliant! What a way to start the winter…and the new IceBreaker Challenge! Saturday training was another glorious day. 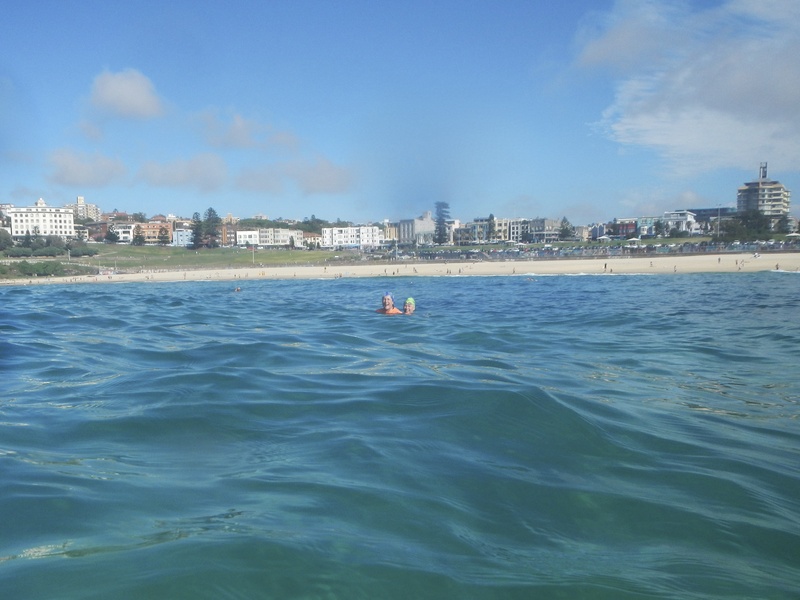 After extending our swims around the south end over the last couple of weeks, Coach Zoe decided it was time to take it to the natural conclusions and swim from Bondi, around to Tamarama and back. Brilliant! It’s been about a year since I last did this swim, and I have come a long way with my swimming since then. Last time I did it, I kind of struggled, ended up swimming by myself most of the way, and was so tired by the time I got there I hopped out and walked back along the path to Bondi. Except not. Unfortunately, although I rarely make to many plans for Saturdays around swim time, I had a birthday lunch to get to. I’d figured it would be OK, since I needed to start tapering on my training anyway before next weekend’s big swim. Anyway, it takes longer than the standard hour (for me at least) to swim there and back, so today was not going to be my day. Ah well, there’s always another day…I’m sure my chance will come around again. Not that it meant there was no swimming fun to be had. I swam out with the group to the point where we regrouped. 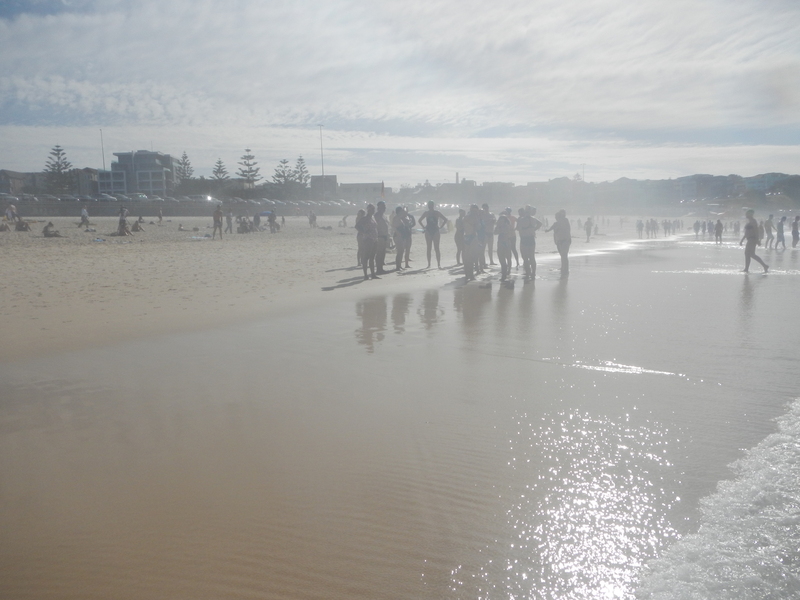 I then headed in with some of the newer swimmers who weren’t yet feeling up for such a long swim, and we stuck together as a group and swam in towards the South end of Bondi. 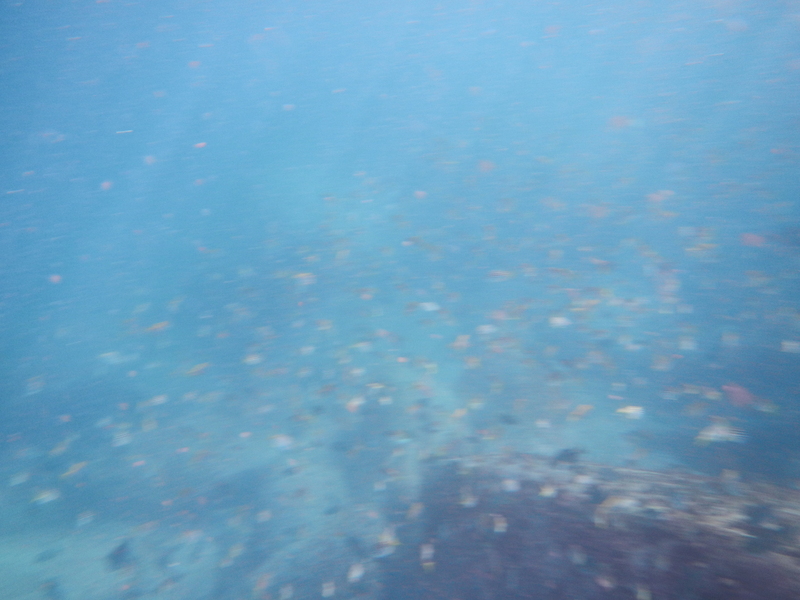 Proving that the ocean always offers something different, we swam over a massive school of fish. I don’t mean a lot of fish swimming around, but literally a horizontal wall of medium sized grey fish, clumped together and stretched out for metres and metres. I managed one snap…it’s not a great one, sorry, but you can kind of see just the sort of density of wildlife I’m talking about. After the initial puzzlement of trying to figure out what was going on, we all stopped just to have a look at the mass of life below the surface. They seemed completely unperturbed by us, and soon enough we set off towards the beach, and the school of fish continued on to wherever they were headed. I love that the ocean can still floor me with awe and wonder, even after nearly 3 years of swimming in it as much as I can. It feels more like an adventure than a sport, sometimes, and that’s one of the many reasons I love it. Just look at all those fish! Wow, I do tend towards the complimentary on here, I admit it. I love this whole ocean-swimming kit and caboodle, and I tend to get a bit excited. This Saturday, though, It was a touch overcast, and I was tempted to stay in bed, but I try to think particularly of the Saturday ocean sessions as my non-negotiable staples. So I got out of bed and I did the Saturday double. And I’m so glad I did. Even if I was to exaggerate it wouldn’t be enough to explain just how mind-bogglingly amazing it was out there. Object larger than it appears in this photo! 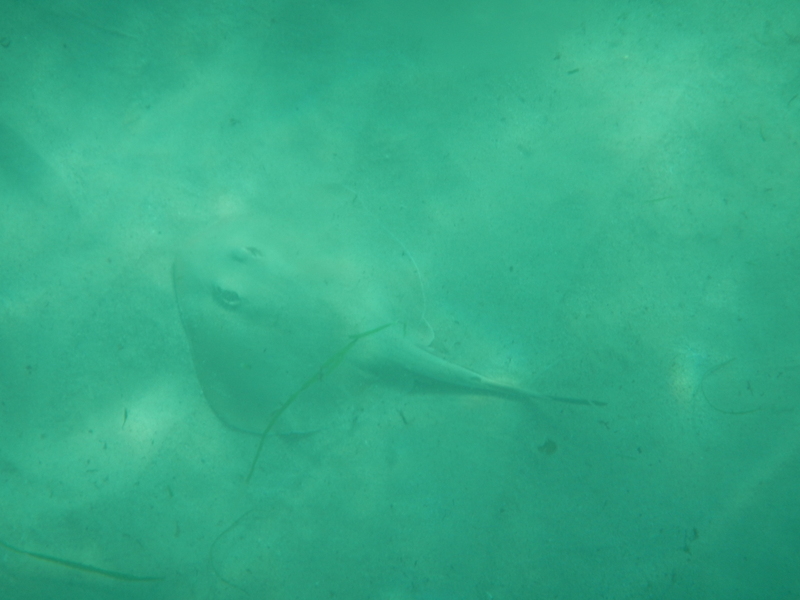 He swam directly underneath me, and he was pretty damn big. 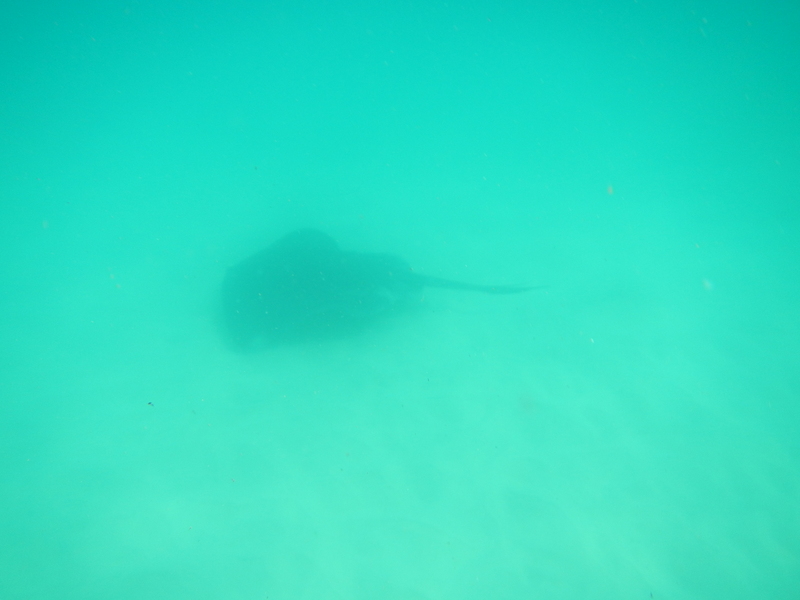 Because of his size I originally thought he was an eagle ray, but a bit of research seems to indicate he was probably a big common sting ray. Regardless, he was amazing. So graceful and quicker than you would think! As the second session began, the clouds cleared and the sun came out. Perfect for a journey swim to the North end! How lucky am I to get to do both swims in the same day? Well, if I thought the massive ray and all the fish were spectacular, the north end was something else agin. The water was literally swarming with all manner of fish. It almost felt like swimming with the schools. There were so many of them and they were all moving so fast that they were impossible to photograph properly, but this horrible picture gives at least some concept of how many little fishies were letting us share their space. After last week’s wintery conditions, the series of sunny Saturdays made a welcome return. I think the photos above can do more justice than my words, but let me just say, it was magnificent. The water is ever so slowly starting to cool off, but it’s still a long way from cold, and it was clear and blue and lovely, with enough critters around to make it interesting. With the water basically flat and the sun shining, there was only one thing for it… a point to point! It was as good as it looks in those photos up there. A swim to the boat ramp, sighting off that slim yellow building (you wouldn’t believe how much time I’ve spent looking for that building over the last few years!) and then looking for the iconic Icebergs (the white building above). The only slightly tricky bit was the challenge to touch the outside wall of the Icebergs pool, and only because the rocks there mean that it can get a bit of chop right at the end and the footing is a bit precarious. As you can see though, we made it right to the wall…and one show-off made it to the wall, out of the water up the stairs and back! For me, touching the wall was quite enough, and I kept it to an hour session because I was keen to keep a bit in the tank for the race the next day. Bloody delightful session…and a fabbo coffee in the sun with the crew afterwards. Ah…it’s soooo tough swimming this time of year! Despite my best intentions, the ongoing home renovation saga and the inevitable post-public holiday workload, I missed training all week this week. Thanks god for Saturday mornings, and training this week did not disappoint! The water temperature at the moment is so stunning. It really makes swimming such a pleasure. The session was my second favourite thing (after body surfing!) to do…a swim safari! Today we headed to the South end, which we do less commonly than the North. I think it’s a little more technically challenging (Wikipedia just told me that ” While the northern end has been rated a gentle 4 (with 10 as the most hazardous), the southern side is rated as a 7″), and the south end is where the surfers tend to be, and that can be a challenge for us (nobody wants to get hit in the head by a surfboard). Like the North end, there is a famous rip that can give you a sweet ride out if you know what you’re doing. It’s known as the “backpacker express” because of the Backpacker’s hostel across the road. Or the numbers unwary backpackers who have taken a ride on it! If you look closely at the first picture of us getting our briefing on the beach below, you can see the “Dangerous Currents” sign in the background…and if you look even harder at the second picture you can actually see the rip itself…the deceptively calm looking spot where the waves aren’t breaking. The joy of a rip, though , for ocean swimming, is that if it’s going in the same direction you are, it gives you a significant boost in speed. And if you know not to swim against the rip, when you’re coming back in, that’s a significant gain. Notice the “Dangerous Conditions” Sign in the background? Can you spot the rip? Once we were out in the rip, we did a swimming tour of the reef along the edge of Bondi Icebergs. There were loads of fish around. Schools of surface-swimming silvery garfish parting around the swimmers, tiny stripy things darting around, a massive blue groper darting out from under a rock to give me a bit of a start, and all manner of speckled and coloured fishies sharing the warm waters. Glorious! (I tried taking photos, but the sky was a bit overcast and they were moving pretty fast…not sure my blurry shots add anything so I’ve left them off). First option was to swim out to the other side of the rip to get back in. Benefits: Safe, flatter swim, chance of catching a wave in. Risks: Surfers! Second option was to shave along the very edge of the reef inside the rip. Benefits: Shorter distance, lots of fish, more to see. Risks: Running into rocks. The group split. I had a think about the high tide and caught a flash of Zoe’s orange rashie heading down along the reef, and decided on that option. And it was completely worth it. I swam with Fiona (I think everyone else took the surf option) and we skirted the reef pretty easily most of the way, surrounded by fish. 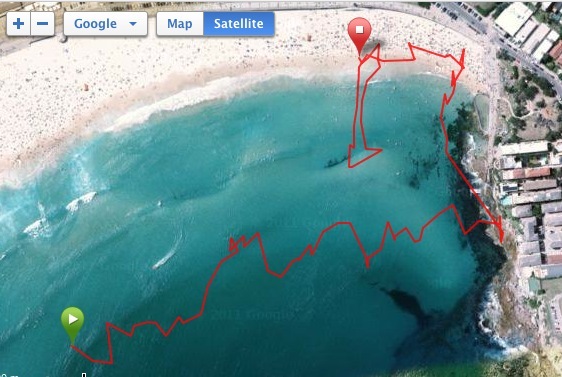 There is one kind of hairy bit, it’s a narrow channel between two shallow rocks, where we had to swim in single file. It was pretty fun, though, as coming out the other side there was a massive school of fish right underneath you. The risky option paid off, as well, as we were back on the beach well before all but the fastest swimmers who took the other option. Ah, such a good session. Good for the soul! Never let it be said that I don’t do things wholeheartedly. After the decision on Friday to call a personal end to the travel, bad weather, general laziness and minor illnesses that have kept me from training (and racing) as much as I’d like, I have been back to training. 3 times in 24 hours. As you do. After a very odd Friday swim, I made it for the double dose on Saturday morning. The water was still definitely on the chilly side, but didn’t seem quite as bad as the night before. The first session was a lovely point to point…just what you need when the water is flat and you need to keep moving to stay warm. 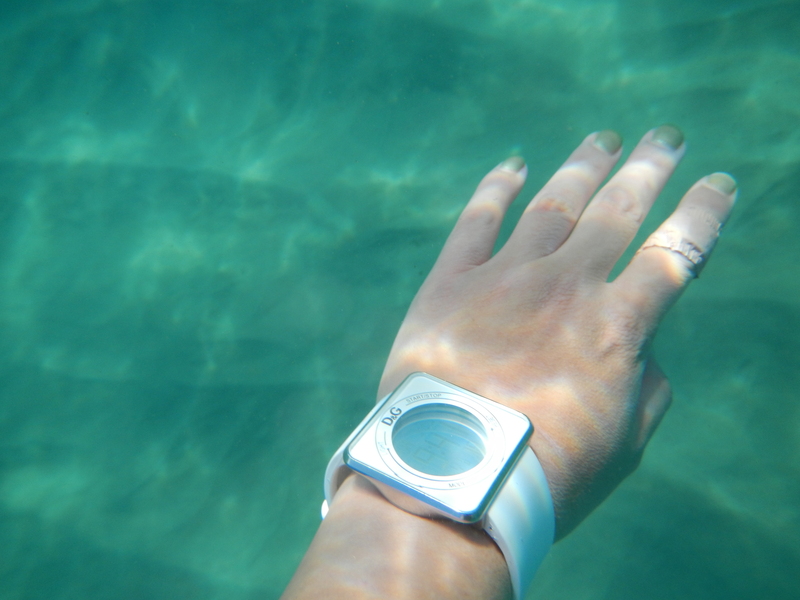 It was crystal clear and the water was a beautiful emerald green…nicely offsetting my hands as they got wrinklier and whiter in the cold! On the beach it was lovely, though…sun shining as we finally got some decent weather on a weekend. 4SEASons Conference Rooms….best meeting centre location ever! Plenty of these guys around….always is. Polarised goggles are the key to being able to spot all the interesting things down on the bottom and swimming around. All in all a particularly lovely (if chilly) day to return to the my Saturday double ups. It also helped that the first session was a point to point, and then by the second session some helpful person had put out a couple of cans. Since you should never pass up the opportunity to train with a real marker to swim around, we did circuits out and around. Nice to have something different for the second session! 27th version of these. Someone cared enough to go through 26 different attempts at helping another living creature who needed it. And didn’t give up after one, or two, or 7 or 15 or 20, or 25…. In the immortal and eternally universally truthful words of Dory…Just keep swimming. I swear I didn’t plan it that way but the big weekend of the Huskisson Triathlon was on while we were on holidays camping nearby at Cave Beach. I’m not a triathlete, but apparently it’s quite a big deal. I also didn’t know (significant other suggested the holiday destination, not me) that there was an ocean swim on Friday night to get people into the swing of things before the bigger events started on the weekend. I did hear about it a few days before. I tossed up whether it was the right thing to do, but on the day of the event, my beloved came down with a toothache, and took some painkillers and settled into the tent for a long sleep. At that point, I figured I wasn’t actually sacrificing any “together” time, so jumped in the car, drove the 10 minutes to Huskisson and did an on-the-day registration. The race was a bit of a funny one. It was a 1km course in a triangle and the water was pretty well dead flat. The majority of the swimmers, though, were triathletes. And triathletes tend not to put too much emphasis on the swim portion of their training as it generally doesn’t make up that much of the overall race. It was very interesting sitting on the beach and overhearing snippets of conversations. There were a lot of very fit people on the beach who were quite worried about a pretty short race in pretty easy conditions. I was trying not to be smug…especially given how I would feel if faced with a triathlon! The race itself was pretty good. I’m so not a sprinter, and it’s been bloody ages since I did a race that short without following it up with a longer one straight after. So decided to consider it a sprint. For all of the nerves, it was a reasonably paced race. 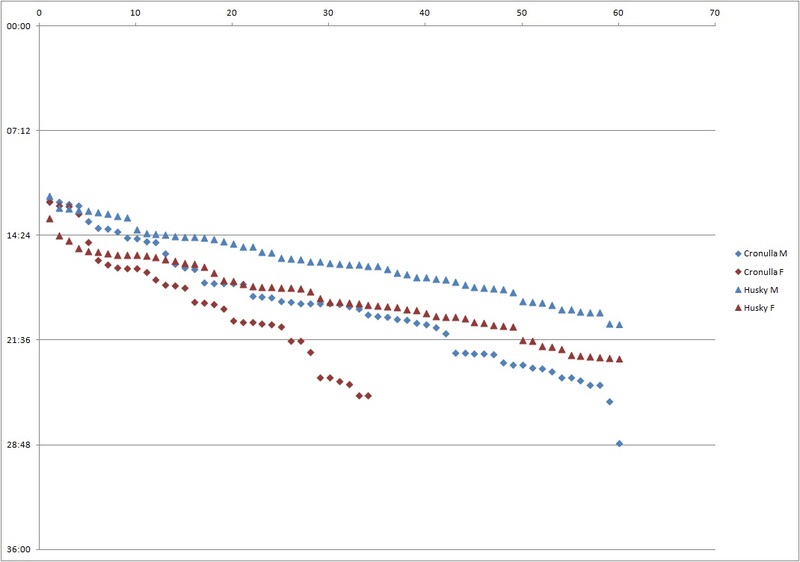 I couldn’t resist and did a bit of a comparison with a more specific ocean swim race of the same length with a similar number of competitors and the tri race was faster at the winners end, but otherwise the finishing profiles were surprisingly similar. Here’s a bit of a chart with the male and female fields split out…. Sorry – I know it’s super geeky, but I honestly didn’t expect to be racing. I didn’t have my camera with me, I didn’t have my garmin on, and since we did a deep water start I forgot to so much as hit the button on my stopwatch! It was a nice swim, though, with lots to see in the water…we even swam over the top of the least-timid wobbegong I’ve even seen! Update – Yep, in response to a few questions I’ve had…lot of them wore wetsuits and tri suits. More than you’d get in an ocean race, although I guess that’s understandable. IMHO, though, would’ve been bloody hot! There was bad news and good news on Saturday. the bad news was that there’s no more Can Too training for the season. The good news was that lots of Can Too swimmers showed up to do the 4SEASons swim on Saturday morning. I’m certain the 9am start, and the title sleep-in it allow for helped! As did the looming goal event for those doing the 1km and/or 2km the next day at the North Bondi Classic. Above all, the good weather stuck around, giving us a glorious day for getting in the water. The sun was shining and there were even pods of dolphins swimming in the bay! I was hoping they might come over for a bit of a closer look at the crazy humans thinking they could swim (it’s happened once before), but for today we had to be satisfied with watching them from a distance. We swam a medium distance, with a slightly shorter session. This was for the benefit of those really wanting to save their best for tomorrow’s race. There is benefit to a bit of a taper in training if you have a big event you want to do your best at. It means you’re going into the event at your peak, not tired or sore from training. As a general rule, you don’t gain any extra fitness in your last two weeks of training, and hopefully by then any tweaks to technique are well and truly embedded, so it’s a matter of eating well, not drinking too much, and doing any last emotional and psychological preparation you need to. Keeping up your presence in the water is part of that, and I have to say, it was a pretty easy task on a day as lovely as Saturday. Especially with the return to beach training of the truly-inspiring Fiona!